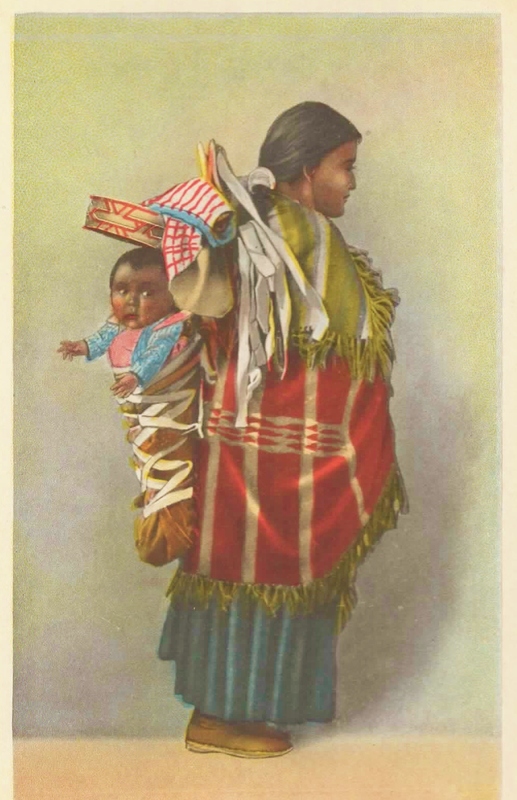 Fred Harvey was a visionary. When the westward expansion of the United States began, customers traveling by railroad had few options for meals along the way. Their only options were usually rancid meat, cold beans, and stale coffee. Fred Harvey, then working as a freight agent for the Chicago, Burlington and Quincy Railroad, had a vision of high quality, large portioned meals served by lovely young uniformed ladies along the rail lines. In 1878, a handshake agreement with the Atchison, Topeka and Santa Fe Railway contracted Harvey to build 3 eating houses along the line on an experimental basis. Those 3 restaurants quickly expanded to hotels, dining cars, and gift shops. 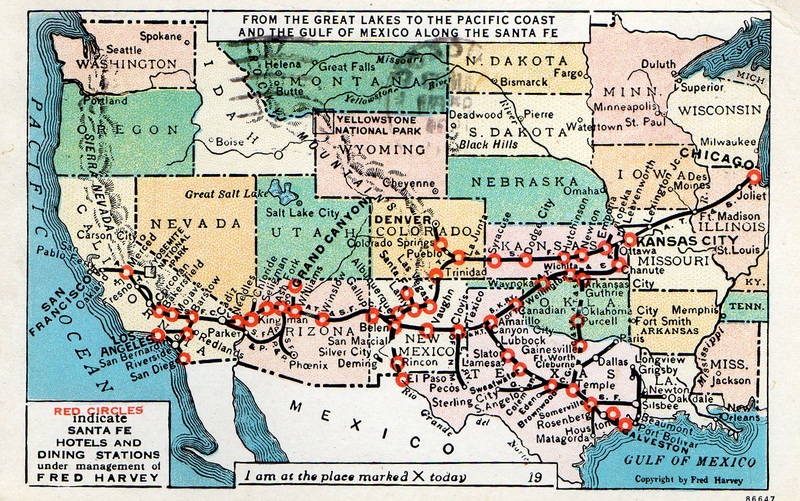 This old Fred Harvey postcard shows the locations of Harvey Houses along the railways. Harvey had accidentally created the first restaurant chain in the U.S.
Harvey implemented a policy of only employing a young female serving staff. He sought “young women, 18 to 30 years of age, of good character, attractive and intelligent” to serve in his restaurants. The girls were paid $17.50 a month, plus meals, room, and tips. A very generous offer at the time. The girls had to abide by strict standards of appearance. No make up was allowed, and their hair was to remain pulled back in a net and tied with a regulation white ribbon. The girl’s uniform was a heavily starched black and white number that hung no less than 8 inches from the floor, with “Elsie” collars, black stockings, and black shoes. 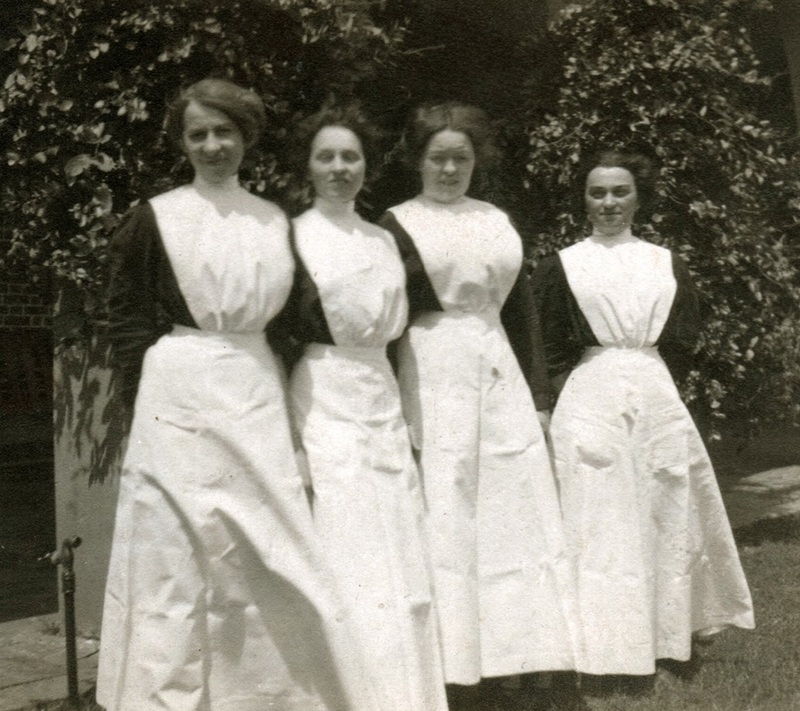 Just look how …glamorous?….these young ladies look. One of Harvey’s best legacies was in his gift shops. 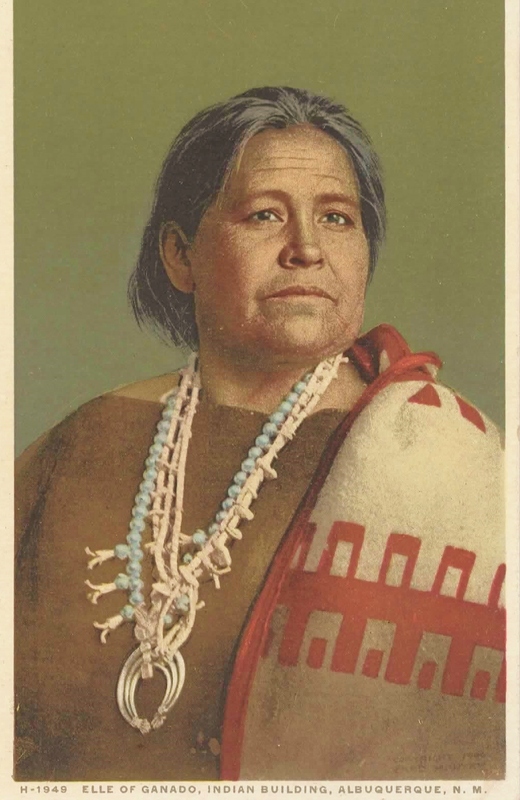 Native Americans were already bartering with each other using handmade turquoise/sterling jewelry as collateral. Pieces left unclaimed were considered “old pawn” and available to trade again. It was Harvey that took it a step forward and supplied the Native smiths with sheet metal, and pre-cut pre-polished turquoise to produce trinket pin jewelry to sell to tourists in his gift shops. Most of this jewelry may, or may not, have been made by Native Americans in an assembly line style. But it didn’t matter. The tourists ate it up, and soon the gift shops were selling earings, bracelets, rings, brooches, money clips, and other trinkets as quickly as the tourists could buy them. These pieces, usually just stamped with native symbols in the repoussage style, although cheaply made, are still highly collected today. They are considered “Harvey Era” if they were made about 1900 to about 1955. 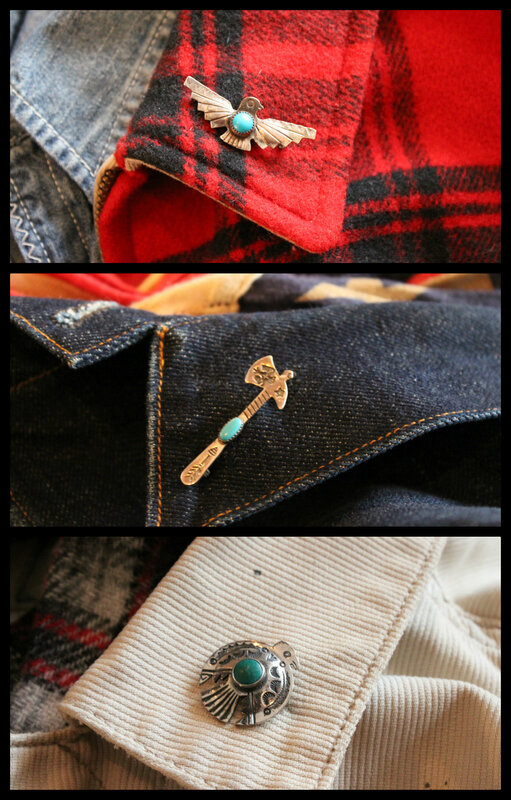 I have several of these Harvey Era pins, most of which live on the collars of jackets….like these. 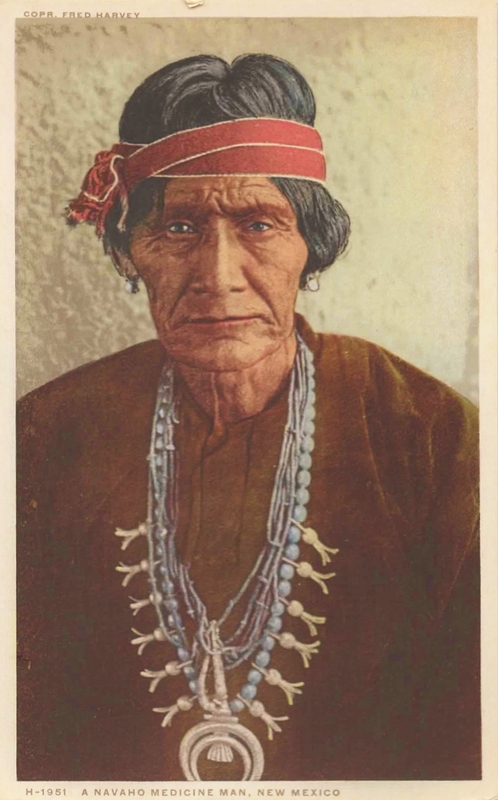 Harvey’s company became the leader in promoting tourism in the American Southwest. but, of course I do……. At his death, Harvey had 47 Harvey House restaurants, 15 hotels, and 30 dining cars. 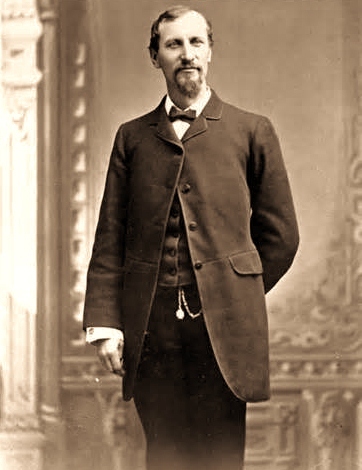 It was Fred Harvey and his vision that drew hundreds of thousands of American tourists to the southwest. Despite the decline of passenger train usage in the United States in the later part of the 20th century, because of the popularity of cars, the company still survived and prospered by marketing its services to the motoring public. ……and they continue to sell trinkets, postcards and souvenirs, as well as offer hot meals on real china, to southwest visitors.